More than 2 in 3 adults in this country are considered to be overweight or obese, according to the Centers for Disease Control and Prevention. As our waistlines expand, so do the number of related medical problems. Obesity contributes to type 2 diabetes, coronary heart disease, stroke, hypertension and arthritis, and costs our health care system billions of dollars each year. The Affordable Care Act requires insurance companies to cover obesity screening and counseling at no cost to you. But with other common weight loss treatments, coverage varies depending upon where you live and what health plan you have. Here are 3 weight loss services and your insurance plan may cover. Most health plans, including all policies sold through your state’s health insurance marketplace, are now required to offer free screening for obesity as part of guaranteed access to free preventive care. If the screening shows your body mass index (BMI) to be over 30, you qualify for free weight loss counseling as well. “What consumers should count on, expect and demand, is what’s called intensive behavioral support for obesity,” says Ted Kyle, spokesman for the Obesity Society. “It should be covered by all insurance plans under the Affordable Care Act,” he says. However, the law isn’t terribly specific in defining what these interventions must include. As a result, services vary widely. Even though plans sold through state marketplaces have to cover a set of essential health benefits that include treatment for obesity, they have the flexibility to decide exactly what’s included. 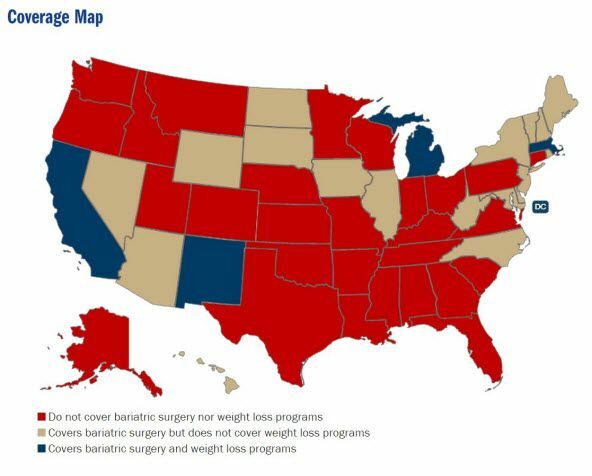 According to the Obesity Society, only five states specifically require plans sold through their marketplaces to cover weight loss programs. That often requires you to challenge your health plan to get the services you’re legally entitled to. “Bottom line is health plans are riddled with inconsistencies about covering medically necessary care for this chronic disease and for prevention of its complications,” Kyle says. Check the details of your plan and be prepared to appeal your insurer’s decision if your care is denied. There is no specific requirement under the law that health plans cover the cost of bariatric surgery, but in most cases Medicare and job-based insurance do. By contrast, only 23 states require private health plans sold through their marketplaces to pay for the procedure. Even if your plan covers bariatric surgery, you’ll still have to demonstrate a valid medical need for it. Generally, you either must have a BMI of 40 or higher or a BMI of 35 with at least one obesity-related condition, such as Type 2 diabetes or heart disease. Also, be sure to ask about coverage for follow-up procedures you may need after bariatric surgery, such as removing excess skin or even a second surgery down the line. Kyle says both are often needed and should be covered, but insurers often deny the care. Health plans have a spotty history paying for FDA-approved weight-loss drugs, and the Affordable Care Act doesn’t require their coverage specifically. Still, things are starting to slowly change for the better, Kyle says. “Often times people assume that weight loss drugs are not covered, and in the current environment it’s best not to assume,” he says. Generally, you’ll need to have a BMI of 30 or a BMI of 27 with obesity-related illnesses for weight-loss medication to be covered.